Hey everyone, sorry for delaying this review. Part of me wanted to push to get it posted, but my more rational side told me I needed to wait until I tried both flavors before posting. Oh, before we begin, two disclaimers. One, these are all free samples provided by Rice Creams. Two, I adore rice krispies with every fiber of my being. I can remember being like 6 or 7, pouring myself a big bowl of rice krispies, and then just coating it with heap after heap of sugar. As I got older, my love of them never waivered. I mean, I just had a bowl of frosted rice krispies for breakfast thursday morning, and before that, I had some for snack tuesday night. I love rice krispies, so if you are going to mess with them, you better do it right or I will not be happy. These are rice creams, and good news my friends, they are done right. These are definitely not Q-Bees! Not by a long shot!! 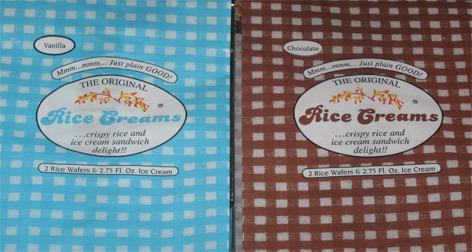 "cripsy rice and ice cream sandwich delight!!" Vanilla! I've had them both and while the chocolate is good, the vanilla is excellent. Even though I was completely full from the first vanilla one, I totally wanted a second. This treat is unique, how can I resist? When I eat the chocolate one, I am reminded of chocolate soft serve. When I eat the vanilla, it's much more about the crispies, and not just any crispies my friends. I'm not talking about those junky store bought rice krispy treats with their 37 ingredients and glycerin based nature. No no no, just like the Rice Creams "about us" story goes, I remember rice krispy treats the way my mom use to make them. Rice Krispies, margarine, and marshmallow. That's how the flavor should be, nothing else. Simple, sweet, crunchy heaven. And now it's right here in my hand. Now you are probably wondering what it's like to eat one of these. Well, we've got our excellent (and slightly sticky) rice crispy wafers. We've got a filling that could easily be straight out of a softserve machine, and then we've got the whole thing frozen together. Now I'm thinking you are suppose to let these melt a bit, but it's just so hard to wait! They are definitely solid, but not crazy so. For example, I was able to cut about a third off of the vanilla one to share it with my wife (who gave it a thumbs up ofcourse). As you might expect, the frozen rice krispy treats can be a little rough on the roof of your mouth , but just a little more so than a regular rice krispy treat. With all of that said, I had no problem plowing through my treat, and this is actually my one regret. 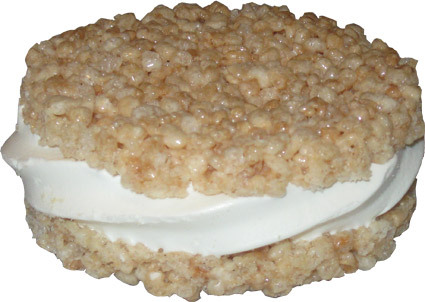 When you first start (the vanilla), there's a really strong rice krispy treat flavor that inspires you to take another bite, and another, and another. Unfortunately as I was eating quicker and quicker, the rice krispy treat flavor started getting lost to the vanilla filling. 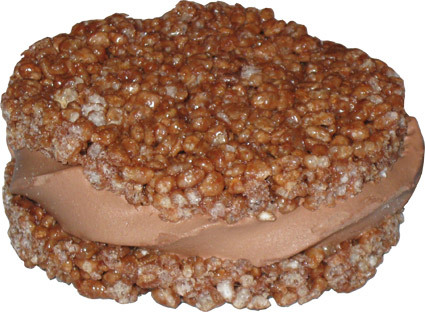 As much as I enjoy the rice krispy and ice cream combo, I really want the rice crispies to be #1 and then the creamy ice cream filling backing it up. It does do this, but I have to be more patient when I eat the second set of samples. Oh geez, almost forgot to show you the size comparison. Don't worry, I didn't drink the lemonade with the chocolate one. I try to go into everything with a fresh palet so as not to distort any flavors. I really was surprised at how chocolaty the chocolate one was. I know I ate it too fast, but the texture was hitting me without giving me that rice krispy flavor blast. 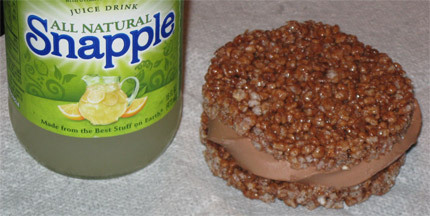 Maybe this one is for those that want chocolate flavor with the rice krispy texture. I will definitely go a bit slower when I second scoop this one. Thanks again to Drew for the free samples, I know shipping frozen goods isn't cheap. If you happen to be near Clifton, NJ, you can stop by the factory and pick up a dozen of these for just $12!!! If you aren't near there, keep your eyes open at "institutional and concession-driven outlets" where you will find them for 3-4 dollars a piece. A concession driven outlet could be something like a stadium or an amusement park (like Morey's Piers). The good news is that Rice Creams is heading north through New York and Lower Connecticut, so let's hope in time that we can all try them. Damn, I was really hoping to order a few but the shipping costs are insane. I hope more retailers start carrying them in the North East. Get in the 'buru Roddy, it's time for a road trip! Wow - these look awesome. I'm right there with you in the Rice Krispy love. They've been my favorite all my life, and since I regularly use them as an ice cream topping anyway, I will definitely give these a try if I ever see them. Thanks for the great review! heres hoping they start moving into the albany, ny area soon. I love searching for the nearest retailer for something this delicious and seeing "2362.2 miles" come back at me. It's tough to consider those high shipping costs without having tried one, but they certainly look good. Woww these look like heaven yum yum yum!